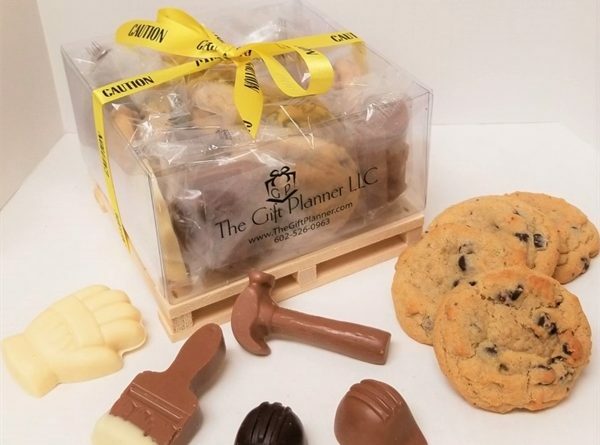 Themed chocolate tools and chocolate chip cookies inside a clear gift box on top of a wooden pallet. 8 pieces of delicious milk, dark and white chocolate themed tools and 12 delicious gourmet chocolate chip cookies. Dimensions 6 inches x 6 inches x 5 inches. 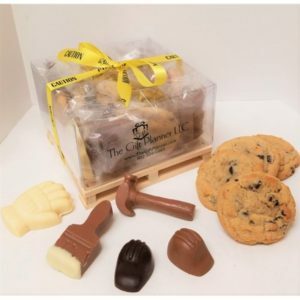 Chocolate tools include 2 chocolate hammers, 2 paint brushes, 2 white chocolate gloves and 2 chocolate hammers. Imprint your logo on the box. Gift includes caution ribbon, which ties around the gift box. 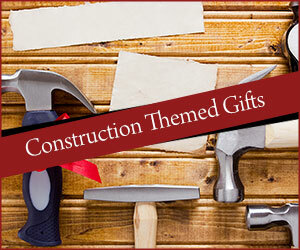 Perfect sweet treat for any construction or contractor company! Say thank you or happy holidays to your favorite clients!